“Cities, like cats, will reveal themselves at night,” wrote the poet Rupert Brooke. Before the age of electricity, the nighttime city was a very different place to the one we know today – home to the lost, the vagrant and the noctambulant. Matthew Beaumont recounts an alternative history of London by focusing on those of its denizens who surface on the streets when the sun’s down. If nightwalking is a matter of “going astray” in the streets of the metropolis after dark, then nightwalkers represent some of the most suggestive and revealing guides to the neglected and forgotten aspects of the city. 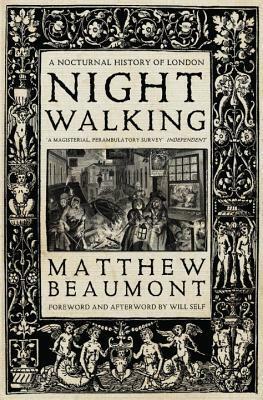 In this brilliant work of literary investigation, Beaumont shines a light on the shadowy perambulations of poets, novelists and thinkers: Chaucer and Shakespeare; William Blake and his ecstatic peregrinations and the feverish ramblings of opium addict Thomas De Quincey; and, among the lamp-lit literary throng, the supreme nightwalker Charles Dickens. We discover how the nocturnal city has inspired some and served as a balm or narcotic to others. In each case, the city is revealed as a place divided between work and pleasure, the affluent and the indigent, where the entitled and the desperate jostle in the streets. Nightwalking was at times a dense read, but no less enjoyable for that. It blends social and legal history with literary history and commentary in a remarkable way, drawing some fascinating conclusions. I loved the profiles of the various writers, and the way Beaumont linked their nocturnal wanderings to their writing, and to the views of the time in which they lived. Given its tone, this is probably a book more for readers used to perusing heavier, academic texts than those looking for a light non-fiction read along the lines of Peter Ackroyd. However, if you are inclined to give it a try, it more than pays off your time and effort as it is an intriguing study.